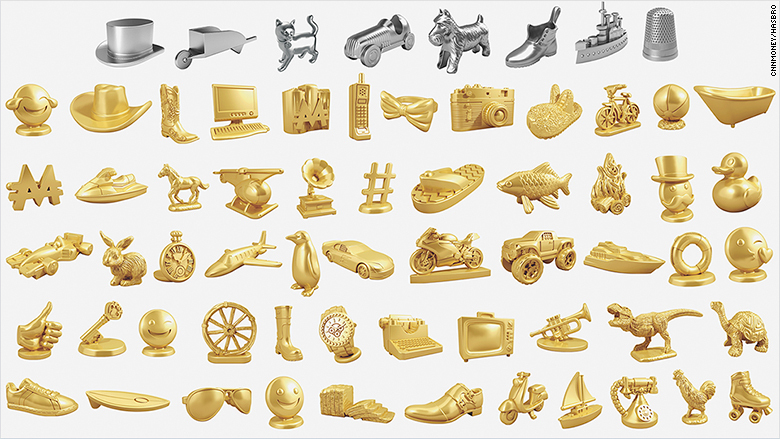 Monopoly's game pieces may look very different the next time you play. 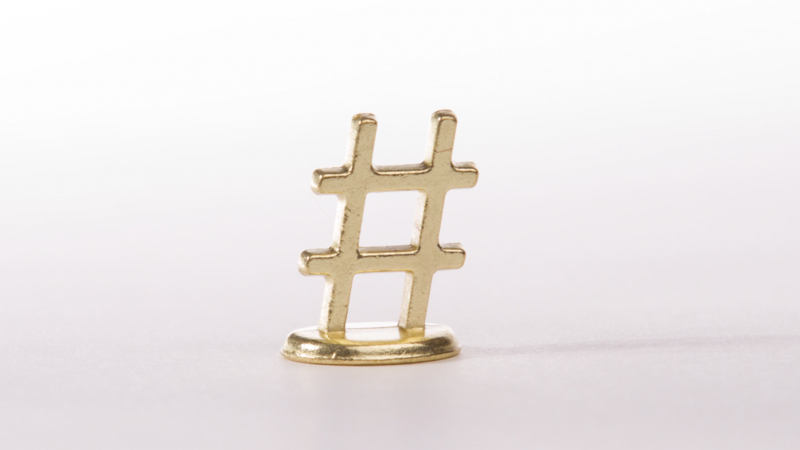 In fact, instead of fighting over the silver shoe or thimble, you could be left holding a bath tub, a dinosaur or even a hashtag symbol. 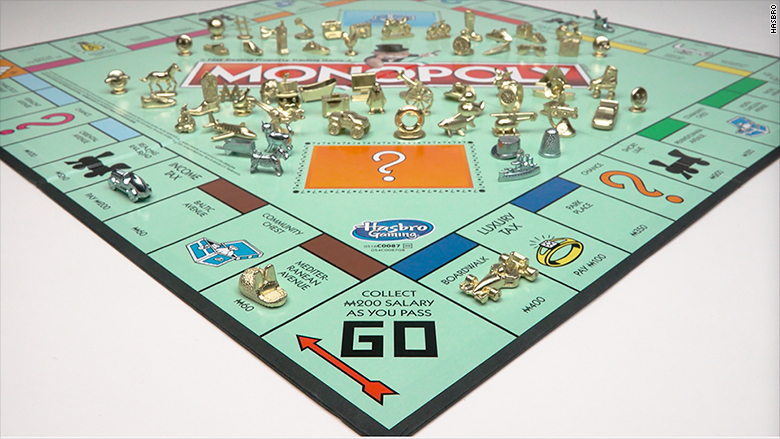 For the first time in the brand's 82-year history, Monopoly -- owned by toymaker Hasbro (HAS) -- is letting the public decide if they should replace all of those game pieces with something new. The company launched website VoteMonopoly.com on Tuesday to encourage the internet to choose the eight figurines (or "tokens") featured in its upcoming version of the game. Of the 64 suggestions listed, 56 options are entirely new. The other eight are the classic tokens, such as the top hat. The new suggestions are inspired by pop culture and social media. Monopoly fans can vote on the 8 tokens (gold are the new ones; classic tokens are in silver) they want to see in the next generation of the classic boardgame. Hasbro is crowdsourcing votes until January 31, and there's no limit to how many times you can weigh in. The top 8 most-voted tokens will be revealed in March and become a permanent addition to the game. This means, of course, the iconic shoe could actually get the boot. But the public could also pick all of the classics again, and your dreams of a monster truck piece could be crushed. "Over the years, we've allowed Monopoly fans to participate in the evolution of the game, but we've never before let the public pick all the tokens for the game," said Jonathan Berkowitz, senior vice president of marketing for Hasbro Gaming. In 2013, fans were able to vote on which token would replace the classic iron game piece. 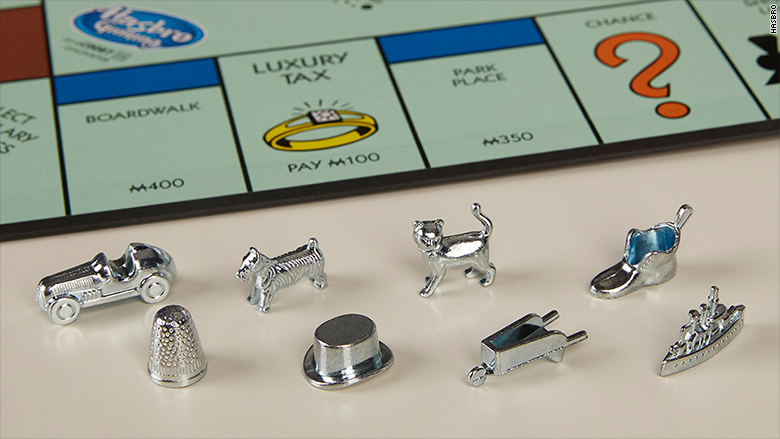 The winner -- a cat -- has since been added to newer versions of Monopoly. The latest version of the game will hit shelves this fall and cost about $20. Hasbro is also separately releasing a limited version called Monopoly Signature Token Collection Edition this spring. It will include all 64 tokens up for vote. Although crowdsourcing input is unique for the company, there have been 300 different versions of Monopoly to date. Most recently, Hasbro released a cashless version of the game -- Monopoly Ultimate Banking -- which used bank cards and an electronic banking unit, instead of its classic paper money.